Once a year Bali comes to a total standstill. There is not a sarong seller or motor bike in sight, planes are grounded, shops and restaurants are closed, boats remain moored in the harbors, the streets are abandoned, the beaches deserted and even the most perfect wave will be unsurfed. This is Nyepi, and for 24 hours the island falls under its cloak of silence. Nyepi, ‘the day of silence’, marks the beginning of a new year, in accordance with the Hindu lunar calendar, Saka (one of three calendars in operation in Bali,) and falls on the day following the dark moon of the spring equinox, this year on March 16th. Life on the island is inextricably linked with the spiritual realm and of the myriad of holy days celebrated, Nyepi is one of the most important. In order to understand Nyepi it is necessary to delve into the often complex world of Hinduism and its tenant of duality, in which the forces of good and evil are in constant play. Order is represented by the Gods, known as dewa and dewi, while disorder is represented by the earth demons known as bhutas and kalas. Balinese Hindus seeks a peaceful coexistence between the two, they do not seek to destroy evil, but to maintain the balance so that it doesn’t get the upper hand. Through a myriad of religious offerings and rituals, the Gods are thanked and asked for blessings, while the forces of darkness who seek to upset the equilibrium are appeased. Theological explanations for the need for silence vary. Some say that by staying hidden the evil spirits will think the island has been abandoned and will pass by, thus bringing an auspicious start to the new year. Others say the silence is symbolic and represents the state of the universe before creation. But Hindu scholars say that the noise and revelry of the preceding evening, Nyepi Eve, wakes up the demons so that they will see the offerings, including blood sacrifice that have been laid out for them. In this view, the silence is a symbol of contentment and gratitude that the demons have been appeased for another year. Regardless of theological explanations, Nyepi is a day reserved for self-reflection and anything that might interfere with this purpose is restricted. Hindus are expected to observe the following prohibitions amati geni (no fire), amati karya (no work), amati lelanguan (no entertainment and pleasure), and amati lelungan, (no traveling). Priests and those with a higher spiritual calling will also fast, observe total silence and pass the day in prayer. Much as we in the west make new years resolutions, the Balinese will pass this quiet day contemplating what they want for the coming year and mulling over the year that has passed. More than three million Balinese are expected to observe Nyepi this year, and although hotels are exempt and tourists are free to do as they wish inside their hotels, they are still expected to respect this day and must stay within the hotel grounds and keep noise and lights to a minimum. Pecalangs (traditional Balinese Security Men) dressed in black, patrol the streets ensuring the silence of Nyepi is not disturbed. The only exceptions are granted for emergency vehicles carrying those with life threatening conditions and women about to give birth. The silence of Nyepi is ushered in by a number of rituals and noisy celebrations which reflect the duality at the core of Hinduism. Melasti is a cleansing and purification ceremony that takes place in the three preceding days. All sacred objects and effigies of the Gods from the temples are taken to the ocean (or river) in long and colourful processions that wind through the streets to the accompaniment of the Gamelan orchestra. People bathe with the deities, in a symbolic cleansing of body and soul and receive the blessing of God Baruna, the God of oceans. The essence of the ocean is deemed to be the essence of life itself and vessels of water will be taken back to the temples. While Melasti is dedicated to the Gods, the ceremony of Tawur Kesanga which takes place the day before Nyepi, is designed to placate the dark forces of nature and takes place at crossroads across the island. Evil spirits are believed to lurk at intersections, causing accidents, so mats of woven coconut leaves are laid with offerings to these troublesome spirits that interfere with life and cause human suffering. Nothing less than Caru (blood sacrifice) is demanded by these hungry spirits and chickens, dogs, ducks and sometimes even cows and buffalos will be sacrificed. 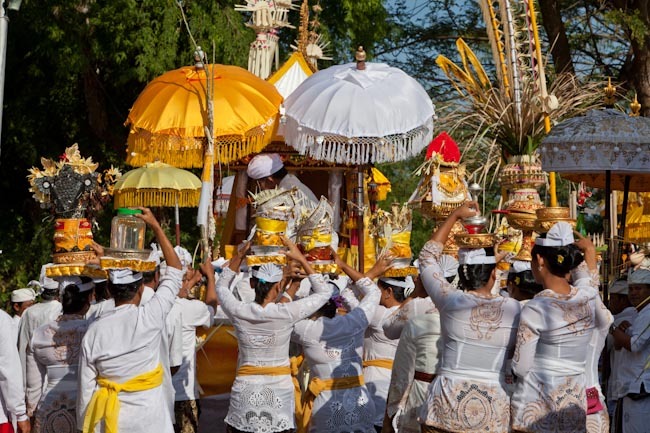 While this may seem cruel to western sensibilities, to the Balinese it is merely part of maintaining order, and such sacrifices are treated with reverence. Animals are blessed and Mantras are recited in order for them to reincarnate as a higher being, hence improving their karma. 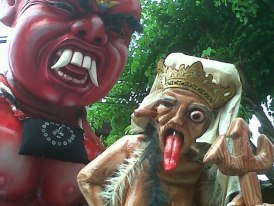 Nyepi Eve is a time of revelry and by late afternoon the island is imbued with a carnival-like atmosphere. Pandemonium ensues as everyone parades the streets banging cymbals, pots and pans, ringing bells and waving flaming torches in order to chase away the bad spirits. Ogoh-ogoh − giant monsters, complete with fangs, bulging eyes and crazy hair are carried through the street before being symbolically burned. With evil neutralized, bodies and souls purified and the Gods thanked, everything is in perfect balance and the Balinese retreat indoors to celebrate in silent gratitude. This long quiet day is a time of rest and regeneration, but the silence is fleeting. The following day is known as Ngembakk geni, literally ‘relighting the fire’ and at 6.00am Bali will roar back to life, in all its buzzing, chaotic glory.